The Central Bureau of Investigation on Thursday moved the Delhi High Court seeking cancellation of interim bail granted to former Haryana Chief Minister Om Prakash Chautala in the JBT teachers recruitment scam case, saying he violated bail conditions. The counsel for the probe agency mentioned the application before a bench of Justices B D Ahmed and Siddharth Mridul and sought an urgent hearing, submitting that the Indian National Lok Dal leader, who had been granted bail on medical grounds, has been campaigning for Haryana assembly election in violation of bail conditions. The CBI also wanted Chautala's date of surrender to be rescheduled from October 17. The former chief minister, who has been convicted and sentenced to 10 years jail term in the JBT teachers’ recruitment scam case, had on September 26 volunteered to surrender after which the court had fixed October 17. "I have already issued a notice on a similar application earlier," the court said on Thursday on CBI's plea. "That application was moved by a third party," the counsel for the CBI replied. "Then get it listed for hearing today itself," the court said. The CBI, in its fresh plea, has also sought a direction to Gurgaon-based Medanta hospital to explain as to how an 'ailing' Chautala has been allowed take part in election campaign. Earlier, the High Court had issued notice to CBI and the INLD leader after senior advocate Vivek Tankha, who appeared for the petitioner, contended that Chautala intends to "misuse the grace period of 17 days given to him to surrender" by planning to campaign during that period. Tankha had also said that Chautala has released a tour programme of his election campaign which has been published in news reports. Chautala had volunteered to surrender as the court was about to order constitution of a medical board of doctors from All India Institute of Medical Sciences to opine on the necessity of keeping Chautala hospitalised, as he had addressed a rally at Jind in Haryana on September 25. The plea had contended that the INLD leader intended to use the intervening period before his surrender "to campaign extensively in the state of Haryana". The petition had also contended that Chautala was "misusing the orders of the court and taking the court for a jolly ride, thereby abusing the process of law". 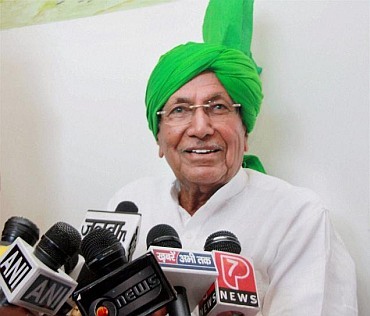 It had also said that Chautala was granted bail on medical grounds on May 21, 2013 and since then he has been out by extending it on the same ground. On July 11, 2014, the high court had reserved its verdict on the appeals of 55 convicts, including the Chautalas, in the JBT scam case. A special CBI court on January 22, 2013 had convicted and sentenced Chautala, his son Ajay and eight others to 10-year jail term each for illegally recruiting 3,206 junior teachers in 2000. Among other convicts, 44 were sentenced to four years in jail and one given a five-year jail term. All of them were held guilty of cheating, forgery, using fake documents as genuine, conspiracy under IPC and of abusing their official position under Prevention of Corruption Act.